Early this morning I started my motorbike trip at Khao Mai Kaeo at the 331 in direction of Chachonsao. The 331 is a bit busy at Bo Win, no fun for riding the bike. 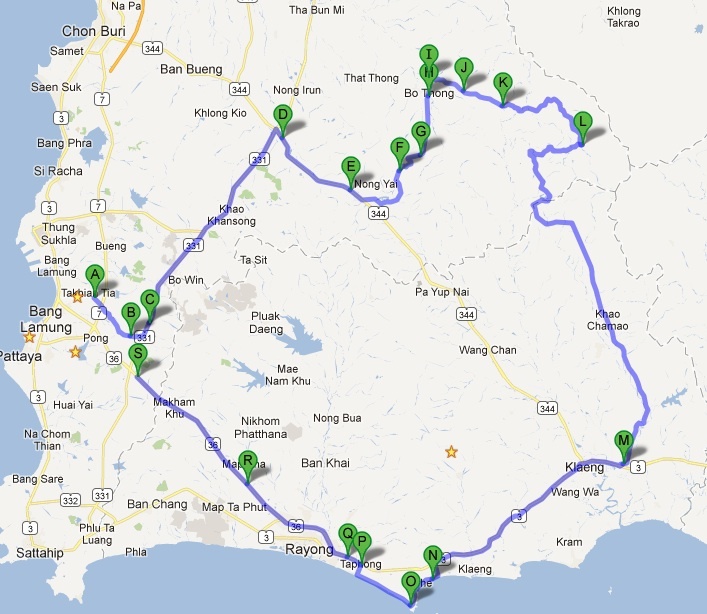 So at the intersection of the 344 I took a turn in direction of Rayong, from here the road becomes more fun to drive. For more motorbike trip reports in Thailand see MOTORBIKE TRIP REPORTS. 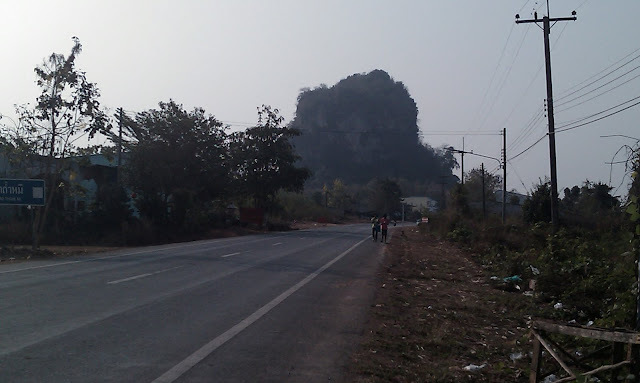 At the intersection of 3245 I took a turn in direction of Nong Yai and Bo Thong. First you are passing a few factories and later you are riding trough palm-oil trees and rubber trees. Just after that you go over a small mountain. At Bo Thong I took the 4017 in direction of Phluang Thong. And here the landscape become a little bit karsten style with mountains popping out of the earth. Of course at all mountains are temples and even wild monkeys. One of the mountains is called "Dinosaurs Mountain" because it looks like a Dino that sleeps. After that I was suddenly on the 5002 and did pass "Wat Khao HaYot" and somewhere I changed to the 3377 to Khao Chong Lom to go from there to Sukhumvit road (Route 3). I took the turn in direction of Kleang and after Kleang ... well much later a left turn to Ban Phe. While sitting at a seafront restaurant I had breakfast as the first customer. Tired after 230km riding. After breakfast I drove along "Hat Mae RumPhueng" (longest stretch of beach of Thailand?) and then took Sukhumvit road again in direction of Rayong to take the 36 in direction of Pattaya, ending up again taking the 331 back to Khao Mai Kaeo. Almost 300 km done!